So this past couple of weeks, I've found myself in something resembling a sort of horror doldrums. Not that there haven't been films worth watching mind you, but nothing that at least for me, spoke to that inner enthusiast horror fanboy who gets giddy whenever a passionate project comes together in such a way that its whole equates to much more than the sum of its parts; a focused vision that is nearly uncompromising in it's delivery. And then we watched The Void, the gloriously violent, terrifying brain child of Jeremy Gillespie and Steven Kostanski. Two people that absolutely get the kind of cosmic horror and hopelessness that would come with this particular subject matter. Two people who also completely understand just how necessary it is to present this horror in the most tangible way possible, via masterful use of practical fx. Exploding heads, jutting tentacles, bloody cryptid births, and viciously deformed corpses that spring to life - all of it - demonstrating the kind of touch that would make Tom Savini proud; so, makeup and effects department, stand tall, fabulous work. Ah! There he is, that inner horror fanboy, smiling and clapping like a lunatic as a result. Right, so in a nutshell we have here a reverent love letter to the kind of occult laden, other-worldly-focused horror found in the darkest places of an H.P. Lovecraft novel. 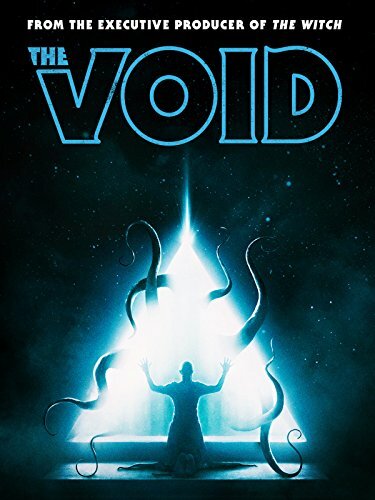 The Void is a slimy, jolting, tentacle-filled celebration of the grotesque; a disturbing, transformative voyage, into hellish abyss, one which promises to test the absolute limits of human perseverance. And gross you the hell out. We are in stale state where solid horror throwbacks are getting harder to find. The genre is filled with them, and the community is growing tired. Filmmakers sloppily throw a retro filter over a subpar film, top it off with a synth heavy score, and expect horror fans to praise the familiarity. Thankfully 'The Void' is far from a gimmicky indie cash in. ...you will not be disappointed. While the performances leave something to be desired, the finished product is a labor of passion and love for the sci-fi horror sub genre. If 'The Mind's Eye' is the 'Scanners' sequel we never got. 'The Void' is 'The Thing' sequel we never got. True horror fans will recognize the respect and precision in the execution. If you are in the mood for something different, something rarely seen anymore, be brave, and step into the Void!